Pressure cook potatoes until soft say for about 3-4 whistles.Peel of the skin and cut into small size pieces and keep aside. Heat oil in pan add cumin seeds,mustard seeds,curry leaves allow it to crackle. Add Onions fry till golden brown,add ginger-garlic paste another 4 minutes. 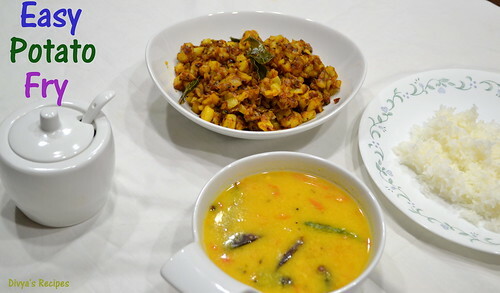 Add the cooked cut potatoes ,turmeric powder,chilli,sambar powder.salt and give a quick stir. Give a stir and fry until the potatoes turn golden brown.then add garam masal powder toss well.Turn over to cook evenly on all sides. 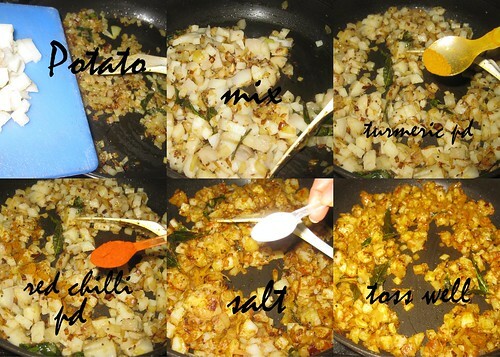 Serve with rasam and rice or curd rice. My favorite potato fry. Lovely spread...looks very yummy! Just need a bowl of curd rice and I can enjoy this plate easily. Wah super potatoes. I make this often as my son loves it !!! an all time fav.. yumm..
Give me that whole plate,will finish it in no time. Potato looks so tempting. Nice one. all time fav,wish to have with curd rice!! 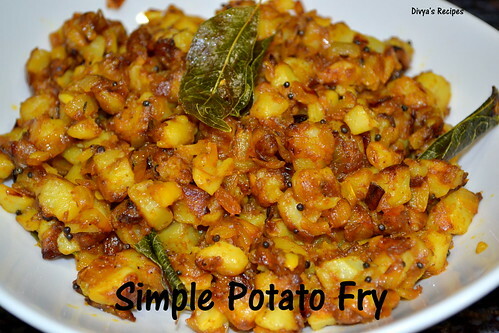 This is a perfect side dish with dal and rice..
Yum. I love to eat it with curd rice. That would be so yumm with rice. it is easy but flavorful. Potatoe fries looks amazing .perfect for curd rice. 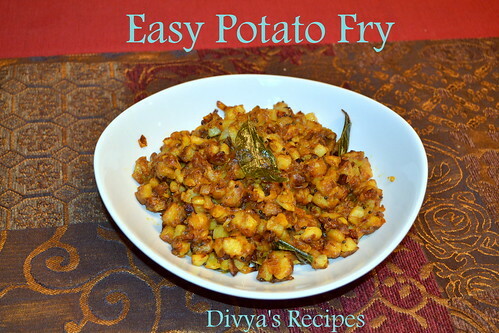 Spicy and yummy potato fry.